Vintage Hood Strap Kit Stainless Steel for Stock Hood. 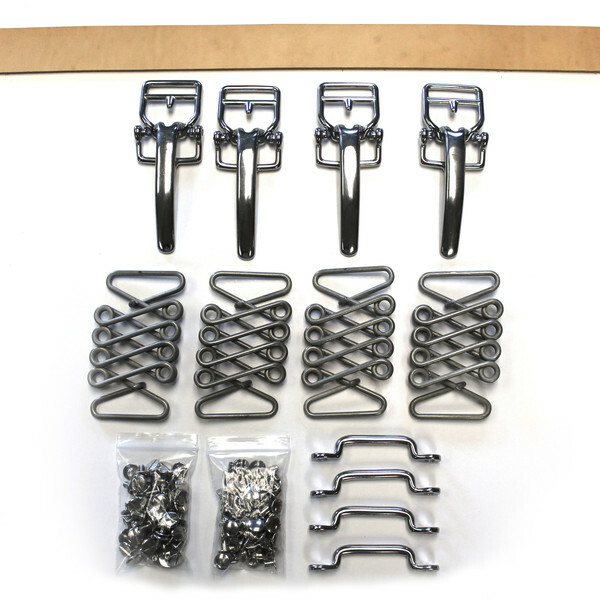 Put a little vintage race car style on your rod with our Vintage hood strap kit. Kit includes the necessary hardware & six feet of 1-1/4" leather. Stainless steel springs & lower mounts with stainless steel two piece screw together rivets make it easy to install. Solid stainless steel release levers make it even easier to use! This kit is for a stock style kit and will need the hood rods to wrap around. Cut leather strips to give 1/16"-1/8" gap between spring loops, the gap is the spring tension when straps are latched. If using a 1/4" hood rod, machine center in half to thread leather under hood top.